Best looking DK set in game! does any1 know good boots and belt for this set? The best belt that I've found so far (besides the ICC heroic ones) to match with any of the T10 colors is Ceinturon de chevalier d'Achérus. It's translucent. I don't think there's a better choice for the blue tier. Similar to the starter legs you get as a DK (The skirt), The scourgelord legs in all incantations have the belt built into their model. As such, and coincidentally, the Acherus Knight's Girdle is infact the perfect belt for this set hands down, as it's lack of a model allows for one to see the pants' built in version of the matching belt. As for the boots, as many have stated, the blue starting zone boots match fine. Bottes brillantes en saronite This matches the set quite well, actually. If you really like the clunky look, the only model I saw that could work (well) are the Kneedbreaker Boots. Maybe patch 5.0 will bring us clunky T10 boots. What would be a good 1h sword to go along with this set? Was thinking Tueuse de l'être sans-vie from Gluth, and Gothik the Harvester in 10 man Naxxramas. And possibly Fureur de la veuve from Grand Widow Faerlina in 25 man Naxxramas. Bottes du troglodyte - These boots go really well with the whole set. The skulls and the colors match fairly well. Note, the image on WoWhead is wrong though, they are blue in-game. Check the link out in-game. If you want to match a tabard with your set, i suggest you to buy the Tabard of the Ebon Blade from Duchess Mynx in Icecrown. Another good choice is the Tabard of the Lightbringer but it is really more difficult to obtain. Croquenots crustacéens will fit this set almost perfectly. Has the cool WotLK model and is just the right colour. The best boots that go with this set are the Heroic version of the Bottines de la force des flots, or the other name equivalents that have the same colour. This is what they look like with the whole set http://www.wowhead.com/compare?items=51125:51126:51127:51128:51129:96542. The colouring is perfect and matches the set the whole way around, the only problem is that you will need to have somewhat decent experience with the game even at this time to do a heroic ToT. So acquiring these boots may not be easy. Feel free to add anything I missed! I just wanted to add some options to this set if anyone's interested. As suggested by another user here, for the belt, I agree the Acherus Knight's Girdle is the best option. I started out with the Boots of the Underdweller, but quickly noticed that an item that I recently picked up from a Garrison mission or quest reward box matched even better, and I don't see the Stompers of Brazen Terror mentioned here yet, so that's my main reason for posting. I also want to mention, if you are looking for more of a femme fatale, but still wicked plate look, the DK Helmet from Onyxia is also a nearly perfect match, and in my opinion, matches even better than the normal set's helmet on non-human characters. 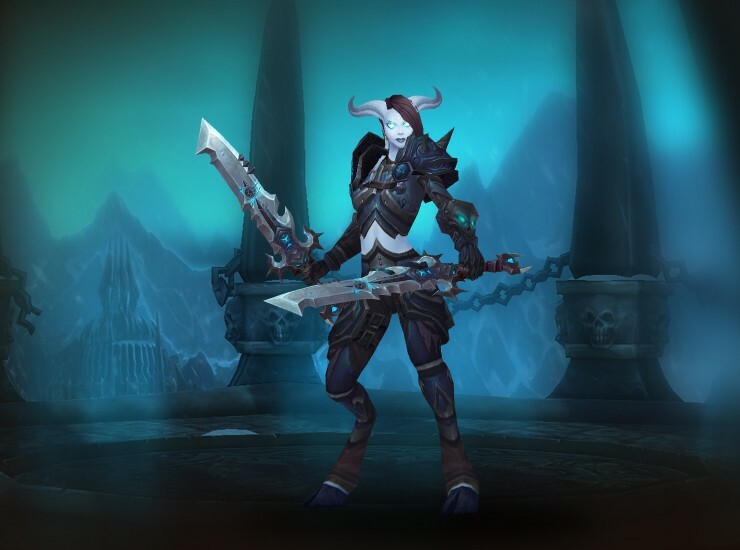 Any suggestion of a different helmet for female draenei DK? Btw, for boots I use Bottes squelettiques antiques, they are nice because these boots are invisible for draenei, tauren, troll or worgen. And, for 1H, the best option for this set is Le Bistouri. This is the best I could find for a cloak color wise, Cape de prospecteur. There may be a better looking one out there then this one. For those of you looking for a cloak to stay with the blue theme for this tier set, I recommend the Proudmoore Cloak, a quest chain reward you can pick up in old Theramore. Ceinturon vorace which came with WoD is a very good belt candidate in my opinion. Boots: Croquenots de terreur éhontée HFC raid drop, or Bottes de guerre de cruauté du gladiateur vicieux if you were smart enough to hang onto these from Cata... this color is no longer available (only the purple ones are, and they don't match)... if you're in a rush, Bottes du briseur de rotules SW/Org vendor, but the previous two choices match better. Blizzard has proved that the matching pieces exist. For Legion, going to the Death Knight Order Hall and looking at Thoras Trollbane, this is the set he wears WITH the matching boots. Ceinturon baigné de flammes en acier is also a good fit for this set imo. Spirales de morilles are the OFFICIAL matching bracers and should be listed as part of this set now. They are dropped by Le roi-lichen, added in BfA. Any suggestions on boots? The matching ones aren't available to players. This set has had both of its missing pieces added in 8.1! Bottes de guerre de gardeneige and Grande ceinture de gardeneige are both available as island expedition drops, and are BoE!